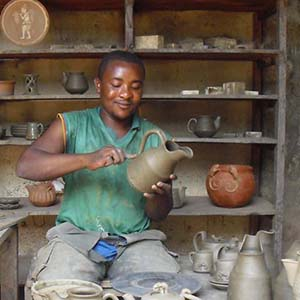 The Presbyterian Handicraft Centre, known as Prescraft, is dedicated to preserving the rich cultural heritage of Cameroon in West Africa. It's goals are to provide employment, stem migration from the rural areas to the cities, preserve traditional craft skills, and to instill self confidence in artisans. Prescraft runs three training and production centers where they offer training courses to youth who have had to leave school. The centers provide employment to the youth and to skilled artisans, who train the young apprentices. Income from Prescraft helps close to 400 artisans cover expenses of education, healthcare, and housing.